Two members of the CPT-SCOPE team, namely Anastasiya Dykyy and Timo Stein, presented the preliminary results of the CPT-SCOPE flight-test aboard BEXUS 20 on October 10, 2015, at the 1st Symposium on Space Educational Activities. The event took place in Padova, Italy and gathered more than 200 participants. The CPT-SCOPE findings were summarised in a conference proceedings paper entitled “The Cosmic Particle Telescope Project – First Results” authored by the CPT-SCOPE core team. Throughout the event space activities of students and space agencies were described. Lastly, a big honour was bestowed on the CPT-SCOPE team. Their paper submission was awarded the "CISAS G. Colombo Best Paper Award". Timo also received a conference sponsorship from the German aerospace agency, DLR. The CPT-SCOPE student team has been supported by IDEAS. CPT-SCOPE logo. Image credit: CPT-SCOPE. 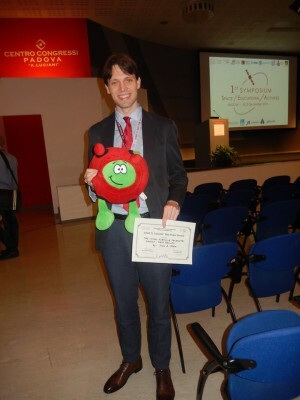 Proud of the achievement: Timo after accepting the award on behalf of the CPT-SCOPE team with the ESA Education mascot Paxi (green). Image credit: SSSA.